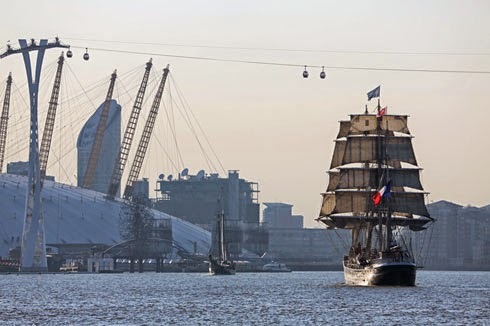 The Tall Ships Festival, which takes place in Greenwich and along the Thames, is over for another year. If you were lucky enough to find yourself in the area then you would have enjoyed a spectacular sight. As many as 50 ships take part culminating in a Parade of Sail, in which all ships take to the river together to sail down the Thames. A great ship graces the Thames in Greenwhich. Image via. If you missed it this year you needn't worry as it’s an annual event. So, with tall ships on my mind, I thought I might tell you about a ship I have the pleasure of admiring here in our shop. It is known as a nef and it really is one of my favourite things. The impressive net which takes pride of place in our shop at the London Silver Vaults. The nef is a fine example of a silversmith really being able to showcase their skills. Nef is an old french word for ship and finds its origins in the middle ages. Originally an elaborate table decoration made in silver or gold, often with gilt work and sometimes even embellished with jewels. The body would detach from the base and these handsome ornaments would then reveal their true purpose. Made to hold wine or port they were sometimes separated into compartments to hold different spices, condiments and napkins. Spices and salt were highly valued and very expensive at the time and therefore such a grand vessel was entirely appropriate. This object would sit on the table in front of the most prominent and important guest as a mark of their status. The nef's base would sit on wheels allowing it to be passed down the table with ease to other guests. As the tradition of grand dining halls grew, the nefs produced became even more elaborate and detailed as they moved into the realms of object d’art. The detailing of these grand silver ships became quite precise and you would find figures of a ship's crew performing duties such as climbing ropes, swabbing decks and other related tasks. Though few dining tables would have need of such an elaborate object to house condiments these days, the nef has its place just by being an object of such spectacular workmanship. It makes the nef a true conversation starter. For further boat-related fun, do take a look at the Totally Thames festival website (click here), which this weekend hosts the St Katherine's Docks Classic Boat Festival. Extraordinary service! And what a timing for the delivery! I am really glad that I chose them for the transporting for my boat. I would suggest discounts on boat shipping to everyone. Streamlines the information discussing between CMS and ACOs, helping benistar ACOs easier access information on their individuals in a secure way for high quality enhancement as well as treatment coordination that may drive critical enhancements within beneficiaries’ care.